Everyday we read about new websites, apps, networks. Today the same happened to me, reading my feeds, I found out this new one named Content.ly. I felt attracted by the name, but my curiosity was even bigger than the attraction. I got in the website and the first thing I read was: Empowering and connecting quality writers and brands. Just right below, there were two options, one if you are a journalist, another, if you are a publisher or buyer; and it works as a network and a platform at the same time for each one. Just when I decide to go in (as a journalist of course) I find myself with a nice and clean page, with an example of how my profile would look, once I start to build it with them. And in this very understandable interface, they let you build a portfolio with your previous work (blogs, websites,etc.) to share it on the network. But is not for everyone, they are looking for the crème de la crème when it comes to content generation; if you ever published for a major site or blog in the past, then you’ll be a great candidate to build a profile. As a publisher, it’s a little bit different. Once you click, the headline is: Step up your content marketing strategy, next, the publisher needs to fill in an application form, explaining the needs of the company. However, as a company/publisher, you are not allowed to choose a writer; based on the application form, Content.ly gives you the best option, this might not look like the best, nonetheless you have to trust in their high quality standards to accept people in the network. The site basically is a job marketplace, specialized in one thing: writing. If you are a blogger, a copywriter (with the background I explained above) all you have to do is become a Content.ly member. If you are a company and you need good writers, all you have to do is look for them in the site. 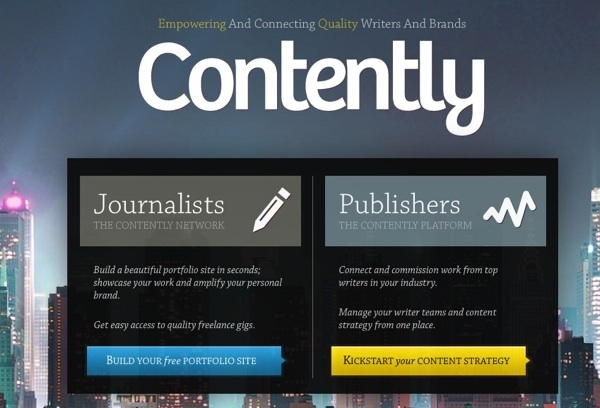 Content.ly was created in 2010, but started to work as open beta until April 2011. Founded by Shane Snow, Joe Coleman and David Goldberg, the idea was to offer an open space, so writers and publishers can connect, however the site evolved to a platform where journalists, bloggers or web content editors can manage their freelance careers, or publishers can create a strategy for editorial operations.